In September 2018, the House Homeland Security Committee approved the Advancing Cybersecurity Diagnostics and Mitigation Act, codifying Continuous Diagnostics and Mitigation (CDM) and requiring it to keep pace with technological advancements to strengthen federal agencies' digital defenses. As agencies complete the first two phases of CDM and enter into the DEFEND phase, how do stakeholders (managers and implementers) view the effectiveness of the program to date and what challenges do they face? To answer these questions, Forcepoint commissioned Market Connections, an independent research firm, to find out what agencies have learned on their CDM journey and the opportunities they see in Phases 3 and 4. 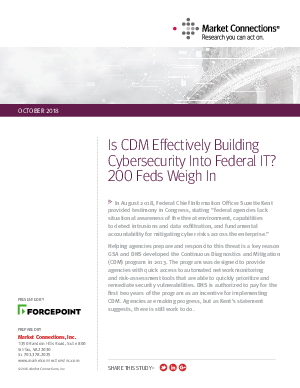 The findings of this report are based on a survey fielded in August 2018, which yielded responses from 200 civilian IT decision makers in the United States. Download the whitepaper to learn more.